Die Fernrohr-Steuerung FS2 ist für alle parallaktischen Montierungen mit bipolaren Schrittmotoren geeignet. Bitte beachten Sie, dass die FS2 ab dem 22.7.2014 aufgrund von RoHS-Beschränkungen innerhalb der EU nicht mehr als Neugerät verkauft werden darf. Für den Export außerhalb der EU wird die FS2 weiterhin hergestellt. Reparaturen sind hiervon nicht betroffen. Jede FS2 Steuerung kann auch weiterhin von mir repariert werden, egal was daran defekt ist. Auch die nicht-RoHS konformen Bauteile dürfen bei einer Reparatur ersetzt werden. Motorkits, Motore, Encoder, Kabel, Netzteile und Ersatzteile sind weiterhin erhältlich. Es wird vielleicht irgendwann eine FS3 geben. Da ich aber nicht unter Zeitdruck arbeiten möchte, werde ich dazu keine Details oder Termine bekanntgeben, bevor das Produkt wirklich fertig ist. Ich kaufe gebrauchte FS2 Steuerungen an, egal in welchem Zustand ! The FS2 Telescope Drive Unit is suitable for all equatorial mounts with bipolar stepper motors. Please note that new FS2`s are no longer available in the EU from July 22, 2014, due to RoHS restrictions. The FS2 is still in production for export outside of the EU. Regardless of RoHS restrictions, FS2 repairs are still possible. Every FS2 can be repaired by me, It doesn't care how much is defect. Even the non-RoHS conform components can be replaced during a repair. 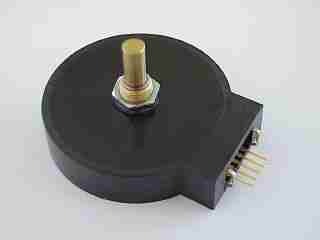 Motor kits, motors, encoders, cables, power supplies and spare parts are still available. It`s possible that sometime there will come a FS3. But I won`t tell you any details or a schedule before the product is really finished, because I don`t want to work under time pressure. I buy used FS2's, it doesn't care in which condition ! Liste der geeigneten Montierungen und Motor-Kits. Was ist Mikroschritt-Betrieb? What is Microstep Mode? Die beiden Schrittmotoren werden mit sinus-förmigem Strom angesteuert, das bedeutet hohe Laufruhe, gleichmäßiges Drehmoment und keine Vibrationen. Dieses Verfahren wird auch als Mikroschritt-Betrieb bezeichnet. The current for the two stepper motors is sine wave shaped. This means that the motors run very silent, with no vibrations and with a very steady torque. This is called microstep mode. 5 frei programmierbare Korrektur- oder Positionier-Geschwindigkeiten bis 3200x, zum Beispiel: 0.25x, 1x, 5x, 20x, 60x oder: 0.3x, 1x, 3x, 10x, 500x. Die maximale Geschwindigkeit hängt vom verwendeten Motor und Getriebe ab. 5 programmable slewing speeds up to 3200x, for example 1/4x, 1x, 5x, 20x, 60x or: 0.3x, 1x, 3x, 10x, 500x. The maximum available speed depends on your motors and gears. You will find some examples on the last instuction manual page. Handbox mit fünf großen Tasten (auch mit Handschuhen zu bedienen!). Das Kabel ist 2 bis 5 Meter lang und bis –30°C geeignet (keine PVC-Isolierung!). 16-stellige rote LED 5x7 Punktmatrix-Anzeige als Koordinaten-Anzeige. Die Helligkeit ist in 20 Stufen einstellbar. Eingebaute rote Taschenlampe mit variabler Helligkeit. The control box has five big keys (can be used with gloves too!). The cable is 2 to 5 meters long and suitable down to –30°C (-22°F) (no PVC isolation!). Red 16 digit 5x7 dot matrix LED display for coordinates and other messages. The brightness is adjustable in 20 steps. Built-in red flashlight with adjustable brightness. All 168 stars brighter than 3rd mag and the sun are available as reference objects, but you can also enter RA and DE of any other reference object. -- If you didn´t find yout object right away: Automatic searching on a spiral-shaped track around the center of the field. Sie können Sie sich den Ausschnitt der Sternkarte anzeigen lassen, wo das Fernrohr im Augenblick hinzeigt und das Fernrohr zu allen Objekten hinschwenken lassen, die in den PC-Programmen vorhanden sind. Die serielle Verbindung funktioniert garantiert bis zu einer Kabellänge von 15 Meter. You can show the sky map on the PC screen where the telescope is just pointing at and you can slew the telescope to all objects that are available in these programs. The serial connection will work up to 15 meters cable length guaranteed. Here you find more informations about suitable PC programs. Bei der normalen FS2 Version darf die Betriebsspannung zwischen 9 und 15 Volt liegen. Alle Versionen haben einen Verpolungsschutz, eine eingebaute Sicherung und ein 1 Meter langes Kabel mit 4mm Bananensteckern. .Als Stromquelle wird eine 12 Volt Batterie oder ein stabilisiertes Netzgerät (13.8 Volt) empfohlen. Bitte verwenden Sie keine unstabilisierte Netzgeräte, weil bei diesen die Leerlaufspannung wesentlich höher als 15 Volt sein kann. Die zweite Version kann von 9 Volt bis 30 Volt Betriebsspannung verwendet werden. Die maximale Schwenk-Geschwindigkeit ist bei 30 Volt etwa doppelt so groß wie bei 12 Volt. Das funktioniert mit jedem Schrittmotor, weil der Wicklungs-Strom durch die FS2 auf den eingestellten Wert geregelt wird. Die dritte Version hat einen eingebautem Spannungswandler. Die Betriebsspannung darf zwischen 10 und 15 Volt liegen, und der Spannungswandler erzeugt intern 40 Volt für die Schrittmotoren. Die maximale Schwenk-Geschwindigkeit ist mehr als doppelt so groß wie bei der 12 Volt Version. The normal version needs a 12 Volts (±3 Volts) DC supply. All versions are protected if the supply is connected the wrong way round, they have a built-in fuse and a 1 Meter power supply cable with banana plugs. 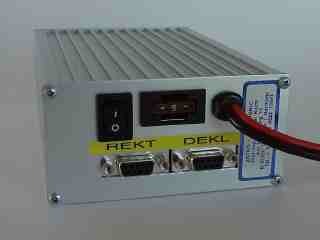 As a power supply we recommend a 12 Volts car battery or a 13.8 Volts DC regulated power supply. Please don´t use unregulated power supplies, because the output voltage of these can be higher than 15 Volts if the load is small. The second version accepts a supply voltage between 9 and 30 Volts. At 30 Volts you have approx. twice the maximum speed compared with 12 Volts. This works with all stepper motors because the motor current is regulated by the FS2. The third version has a built-in voltage converter. It accepts a supply voltage between 10 and 15 Volts, and the voltage converter produces 40 Volts for the stepper motors. This means that the maximum slewing speed is more than twice compared with 12 Volts. We recommend this version if you need high slewing speed and if you only have a 12 Volts (car battery) supply. Die angegebene Winkelauflösung gilt bei Montage direkt auf der Achse, d.h. 1:1 Übersetzung. Jede andere Übersetzung ist aber auch möglich. The angle resolution given above is for mounting direct on the axis of the telescope without a gear. But any other gear ratio is possible too. 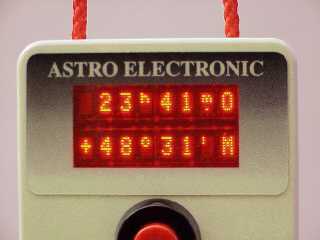 The coordinates in the display are normally calculated using the known positions of the motors (by counting the steps). If there develops a difference between these coordinates and the positions of the encoders (e.g. 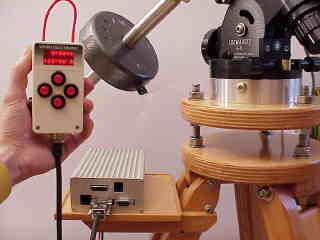 because you did loosen the coupling between the gear and the axis and slew the telescope by hand) then the coordinate display will be calculated using the positions of the encoders. This means that the coordinate display will always stay valid (but this works only if you have encoders, of course). The adjustment of the parameters is required only one time. All parameters are adjusted using the five keys. That´s not difficult because you can always see in the display what you are doing. All parameters are stored permanently even without power supply, but you can always change them if you want. Periodic error correction can be switched on. Learning the corrections can be made with the autoguider. A correction of the declination drift is available too. Optional gibt es die eingebaute Autoguider-Schnittstelle für ST-4, ST-6, ST-7, ST-7e, ST8, ST-8e, ST-9e, ST-10e, ST-1001e, STV und Meade Pictor (15pol. Sub-D-Buchse und 6pol. Western Modular Buchse). Für Starlight Xpress Kameras kann die Autoguider-Schnittstelle in Verbindung mit dem STAR2000 Interface verwendet werden. For an extra charge the built-in autoguider interface for ST-4, ST-6, ST-7, ST-7e, ST-8, ST-8e, ST-9e, ST-10e, ST-1001e, STV and Meade Pictor is available (15 pole Sub-D jack and 6 pole Western jack). 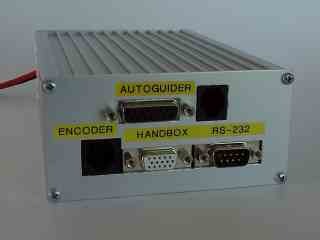 For Starlight Xpress cameras you can use the autoguider interface with the STAR2000 interface. 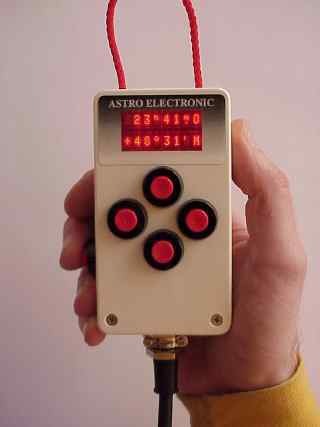 For the Cookbook-CCD-Camera a special external interface is available from ASTRO ELECTRONIC. You can exchange the directions of the buttons. This is useful if you observe with a star diagonal. The timer function shows you the actual exposure time. Motors and display can be switched off temporarily, but there will still be the correct coordinates in the display when you finish this mode. Visitors mode: All functions except simple moving (using the four keys on top) are inhibited temporarily.